OK so I have been very slack lately and haven’t blogged AT ALL, so let me compensate by posting this recipe for “Pak Loh Bak” which is essentially a fragrant Chinese Braised Pork dish which can also be used to cook Braised Duck. Technically, this is not even my recipe, my dad only just emailed this to me today haha. But I’m so happy with how it turned out, I wanted to make sure I don’t lose the recipe and also a few people have asked me to share the recipe already… so OK lah. Here it is! Pounded fresh galangal (lengkuas) fried until brownish. Marinate pork with 5 spice powder and some kicap. Keep for about half an hour. Slow heat kuali, add sugar and kacau until melt (make sure not burned otherwise your dish will bitter). Add some kicap to the melted sugar and kacau for about 2 seconds and immediately add water into kuali. Increase fire until gravy boil. Add marinated pork, fried pounded galangal, cinnamon, star anise and some more kicap until gravy looks dark. Cover to cook in slow fire for about 45 mins. 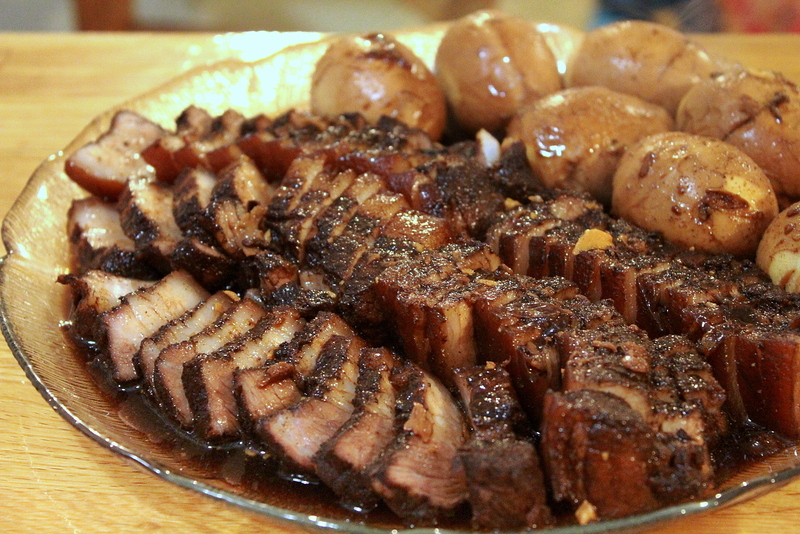 Once in a while turning the pork and add kicap to darken pork and taste. Scoop away the oil as you cook. After 45 mins the gravy should be quite thick. Take out the pork. Add some water into the gravy to boil. Add boiled eggs into gravy and slow boil until eggs look dark. Leave the eggs in gravy. Taste gravy to your liking taste. Slice pork into smaller pieces and add eggs. Top with some gravy and timun or salad. Note: I didn’t have any galangal nor star anise around so just cooked it without those two ingredients and it still worked and tasted yummy! Previous articlePhotographyA Collection of Photos from the past 4-6 weeks! thanks for the recipe its really so yummy. tried a few times already my whole family enjoy it to the maw.